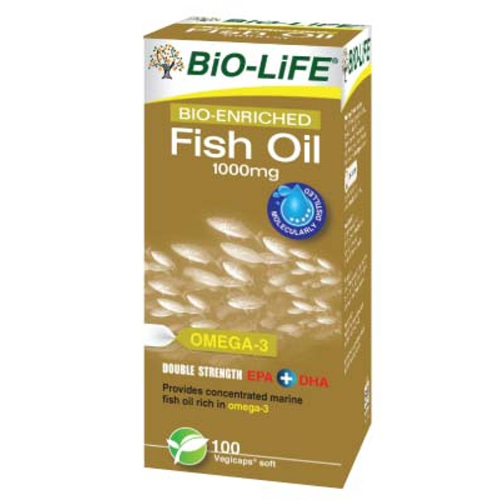 BiO-LIFE BIO-ENRICHED Fish Oil 1000mg is a highly purified double-strength fish oil containing 65% omega-3 marine fish oil derived from the body oil of sardine and anchovy. This fish oil is produced using the latest innovation in "Molecular distillation" and contains 33% eicosapentaenoic acid (EPA) and 22% Docosahexaenoic acid (DHA) in the form of high-potency concentrated omega-3 triglycerides. It is subjected to intense purification to further reduce any potential contamination. 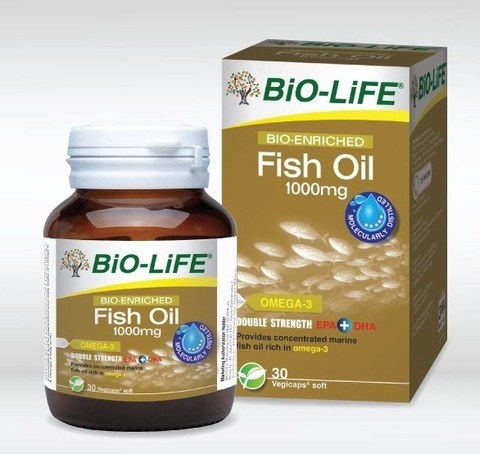 Natural omega-3 triglycerides have an excellent track record of efficacy and safety and many scientists believe they are more bio-available (easily absorbed and used by the body) than the ethyl esters used by other fish oil concentrates in the market. High doses of EPA and DHA are often required to achieve significant improvements in a number of disorders, higher than what can be provided by normal fish consumption or supplementaion from omega-3 seed oils. For patients with coronary heart disease, take one capsule three times daily with food. For elevated triglyceride levels and high blood pressure, take three-four capsules three times daily with food. BIO-ENRICHED Fish oil exerts a mild blood thinning effect and could prolong bleeding time. It should be used with caution with known blood thinning agents such as warfarin, aspirin, ginkgo biloba, garlic and high doses of Vitamin E.
30 softgel capsule pack is BACKORDER item.